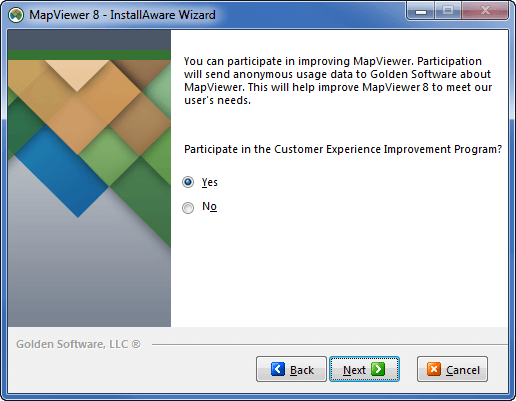 The installer for MapViewer 8 added the following screen asking for participation in the Customer Experience Improvement Program. The Customer Experience Improvement Program allows users to send in anonymous usage data so the MapViewer development team can see how often and how certain features are used. This allows us to add features and customize the user interface to maximize the usability. No personal information is collected. You can decide at any time to opt in or out of this program by clicking File | Options within MapViewer and checking or unchecking the Track usage box in the General section.